PLEASE NOTE: I DO NOT DO $$$$ VALUE APPRAISALS! There are way too many variables: condition, location, time of year, present trends in stein collecting, local (and now national) economics; but most of all = prior expectations by the owner, are among the reasons! I have for over a year now placed these three short “notifications” at the bottom of each page! Norman is a friend of mine and a member of the “Gambrinus Stein (Collectors’) Club ” of Virginia, Maryland and DC, and of SCI. Okay, what do you call these things? 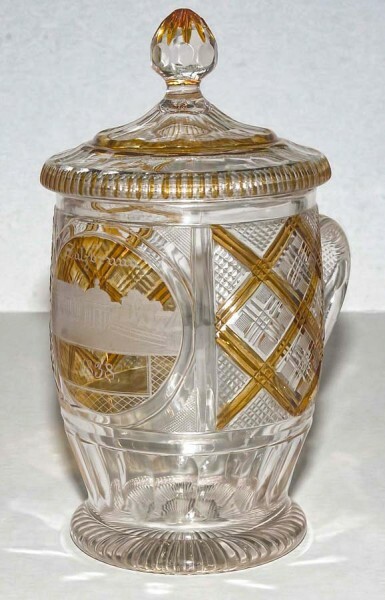 By the Stein Collectors International’s (SCI’s, and the commonly accepted definition, it is not a stein because the lid is not attached to the body or handle. It is not a Pokal because it has a handle. It is not a tankard, for the same reason it is not a stein. It is not a mug because it has a lid, even though Steve Smith calls them “mug mit der deckel.” A very mundane title for something that is so beautiful. I guess I’ll just have to go with a title that truly describes what it is — “stein with a set-on-lid”. No matter what you call them, they are 100 percent glass with glass bodies, glass lids, and a glass handle. Additionally, most of them have intricate cuts, sometimes stained or enameled, sometimes have copper wheel cut scenes (if you don’t know what ‘copper wheel cut’ means, write me via this web site), and to me they are just plain beautiful. I say beautiful because they are pure. 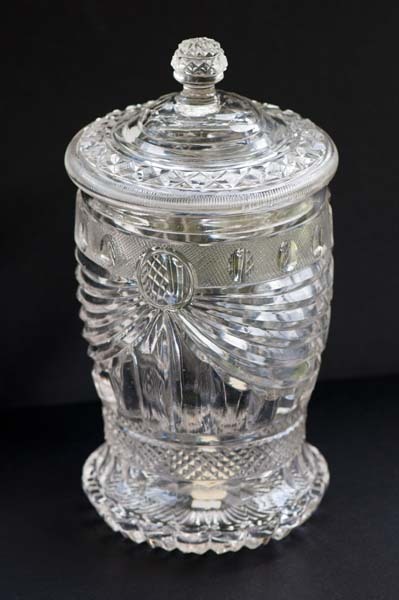 No pewter on the handle, body, or lid to spoil the glass and the refraction of light. The lids are made at the same time the body is made, in the same house, and not added later like many pewter lids. Many are cut from the top of the finial to the bottom of the stein. I personally love the larger, flat, ribbon-like handles, many of which are part of the overall design and as intricately cut as the body. It takes a lot of skill to cut something that thin without breaking it. Ron Fox informed me this type of handle was primarily in use before 1800; but there are examples spilling over into the first quarter of the 1800s. That is a clue to dating glass steins. How did I get started collecting these things? Easy, especially if you have heard one of my talks on spa glass or set-on-lid steins at the Beer Stein College, the SCI convention in Kentucky, or even read my article on the SCI web site several years ago, titled “My Most Meaningful Stein”. The short version is that I bought my first set-on-lid stein from Ron Fox about 1993, pictured on the right. It stands over 10” tall, has amber staining very selectively placed; a cut scene of a spa; and it is, of course, old glass. Cut into the design is the date ‘1838’. That one stein was primarily responsible for starting me down the path of collecting glass steins, glass steins with set-on-lids, and glass steins with spa scenes. I know have 17 steins with set-on-lids varying in size from 6” to nearly 11”. My wife hates Ron. I will digress here for just a minute. 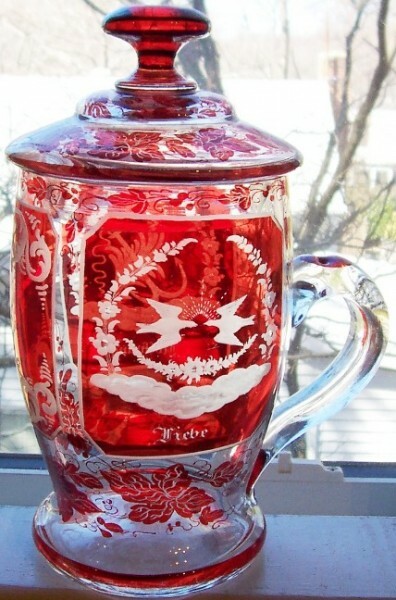 I have found that one of the disadvantages of collecting glass steins and one which I feel holds back stein collectors from collecting glass, is that almost 100% do not have a mark of the manufacturer, artist, or cutter. Hence, nothing to research or method to trace a to a specific factory or artist. And because of that, glass has never had a fixed or set price. No book that is easily picked up, looked at, and from which the collector can say “oh yeah, that’s my stein”. 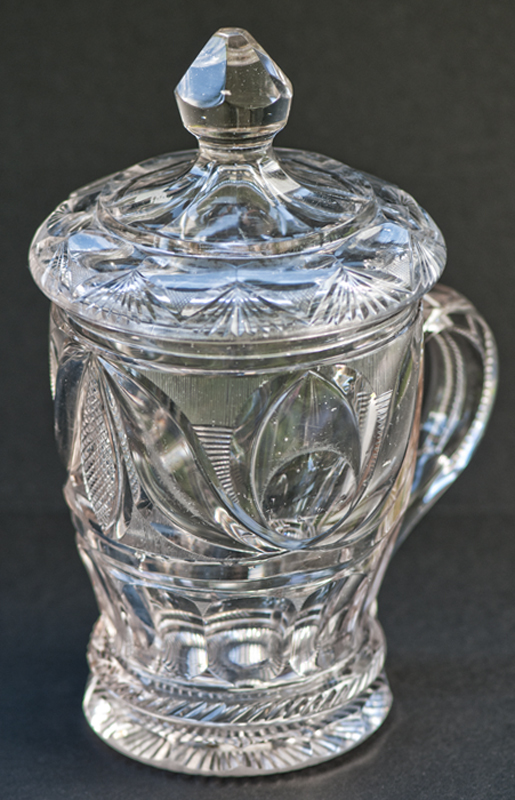 The price of a glass stein comes down to the seller’s asking price (based on what he paid) and what the buyer is willing to pay. 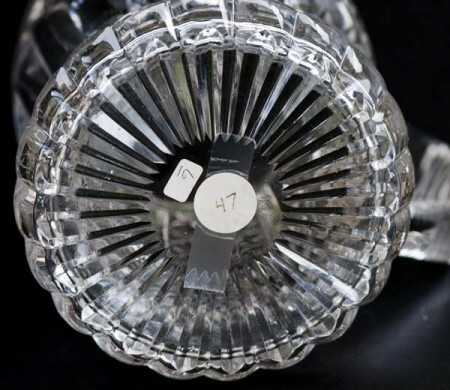 Therefore, the collector must become knowledgeable about glass to figure out the general time period it was manufactured, the quality of the design, etc. How do they guess the age? By looking at the entire stein: the body, the glass itself, the lids, and the handle. After looking at all the clues, they can then make an educated guess. If you are still unsure, bring the stein to one of the glass collectors at a chapter meeting, an SCI convention, or even to one of the popular Beer Stein Colleges. If the steins had pewter lids, they would sometimes be a clue that makes it easier to date. But, remember this. A good pewter repair person can add a pewter lid at any time and if they are really good, you will not be able to tell it was not original to the piece. Another reason why I like the glass set-on-lid is that you can pretty much tell if it was original to the body. If not, it just doesn’t look correct to the overall piece. the Ribbon handle . top to bottom . at Pontil point area. Many artists and decorating houses, including Ludwig Moser, bought the blanks from various glass manufacturers, decorated or cut the body, and then sold it under their own names. As prolific as the company of Moser was, they very, very seldom put their name on the glass. And remember, Moser got his start as a copper wheel cutter doing spa scenes in Karlsbad in the late 1850s. Some of the best glass can only be attributed to a specific decorating house or manufacturer by the color of the glass, the enameling, the cutting, or the style of the body. But very rarely do they make it easy and have a signature and almost none can be attributed to a specific artist. Another factor into why set-on-lids aren’t more popular is that they are rarer and many have chips on the rim of the body or lip of the lid due to not having a buffer between them. It is very easy to click them together and chip it when placing the lid back on the body. 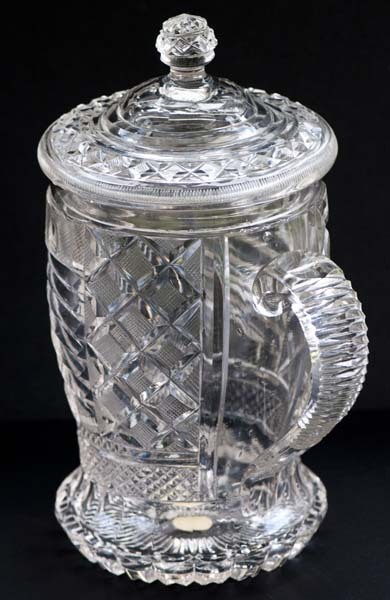 If some of these had pewter mountings to attach the lids, they would have more appeal to the “true” stein collector. The price would also be considerably more. Okay, back to the set-on-lid steins. This style was popular for a very brief period in time, from about 1820 to 1850 – or the Biedermeier period. By around 1850 they were done – stick a fork in them, fini, over and out! Later I will give you Jim Sauer’s and my best guess as to why it ended. 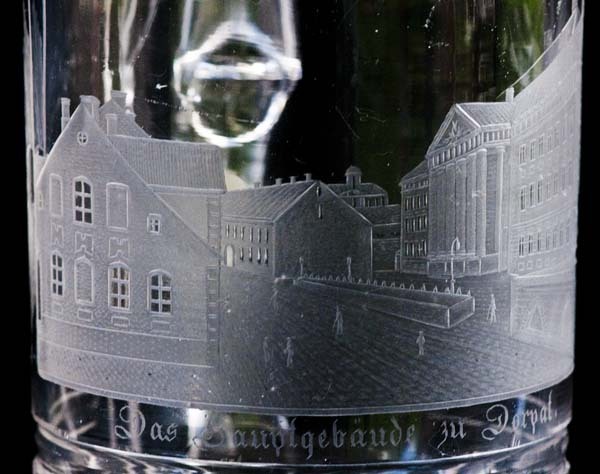 Therefore, and even though most are not dated, set-on-lid steins of quality will be at least 150-200 years old. My most meaningful stein is dated 1838 and the date is cut into the scene on the front; however, this can never be the only indicator of the age of the stein. Of course you can find samples of these made after 1850 and even right up to recent times. You can generally tell thoseat a glance because the cuts are very poor or non existent and generally there is no wear to the bottom of the stein. I have several of these in my collection just to demonstrate how they differ from the earlier period. nicknamed these “BUFFs” – Big Ugly Fat Fellows. Well, if you remember the B-52 nicknamed BUFF, you know what it really stands for. 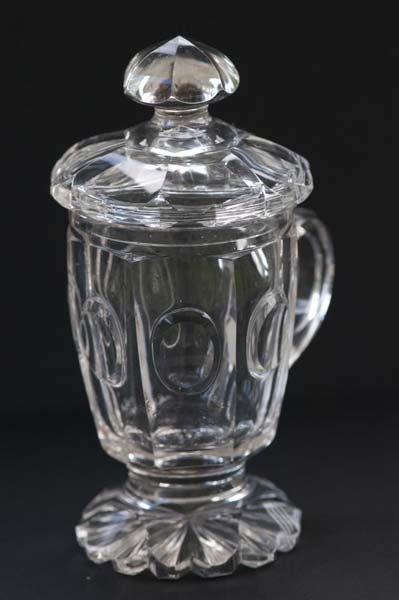 Some of the glass set-on-lid steins from closer to the 1840s fit in to what is called the period of “excessiveness in glassware and cut decorations”, which ended around 1850. Now, why did these gorgeous pieces of glass lose favor in such a short period of time? This from Jim Sauer: John Ruskin, a prominent English art critic, in newspaper articles, had previously blasted all cut clear glass as being “barbaric” and he labeled pyramid shaped cut diamonds “prickly monstrosities” which eventually brought about changes in glassware decorations. Mr. Ruskin specifically seemed to have a dislike for the large, sometimes rather plainly cut pieces. Jim Sauer several years ago wrote of this in his article on glass in an older issue of Prosit. While I’m not sure the demise of this type of stein can be entirely attributed to one critical article or review by Mr. Ruskin, he helped and they definitely did drop out of favor. Other reasons include the rising high cost of glass production, the economy taking a turn for the worse, and the fact that clear glass was being replaced in popularity by the introduction of colored glass that wasn’t exorbitant in price. Chemists had found a way to make ruby glass without using gold to get that nice, deep red color. Plus they developed methods to stain or flash the glass which only took a fraction of the amount of red glass. Colorless cut glass fell out of favor on the Continent for the next twenty-five years. 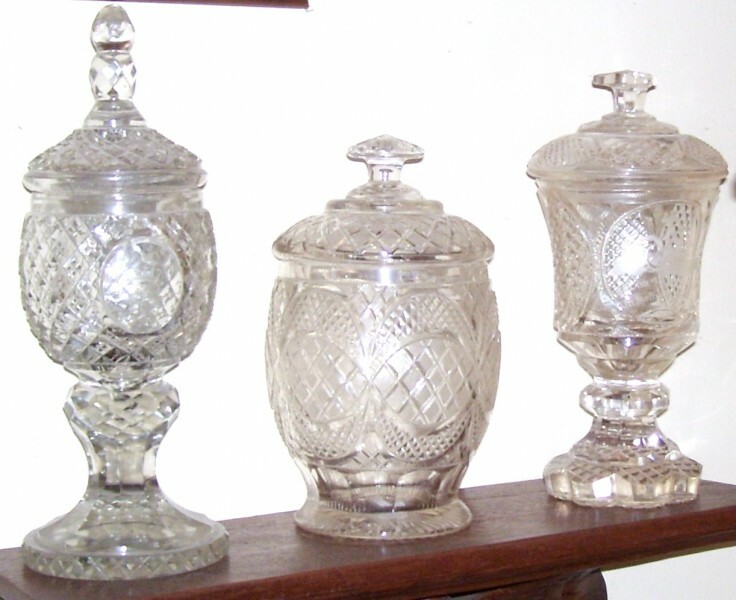 It was only revived after the United States Centennial Celebration of 1876 in Philadelphia when American lead glass was introduced and made such a good impression on the European glass industry. You might ask what was special about lead glass? 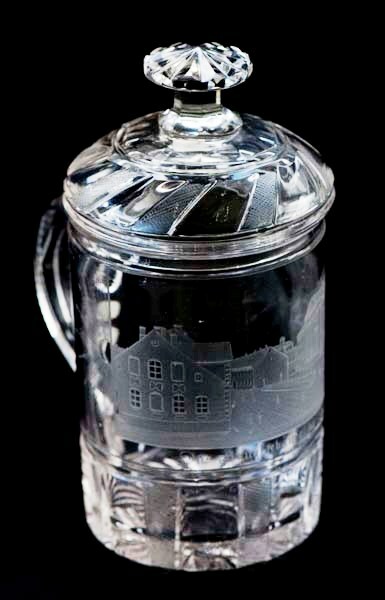 When lead is added to the glass the cuts can be made much smaller and finer, resulting in a scene or pattern with more detail. A final point. Like many glass steins, they seem to be one of a kind. I’ve watched and handled a lot of them at various auctions and private collections and I have yet to find two glass steins that are decorated by cuts and copper wheel decorations that are alike. One will find some mass produced glass with enameling or transfers that are alike but the fine glass you see in a lot of auctions are truly unique. If you consider them one of kind, their appeal does become all the more attractive to the collector. And, their price goes up accordingly. PLEASE NOTE: This was meant to be an informational web site only.